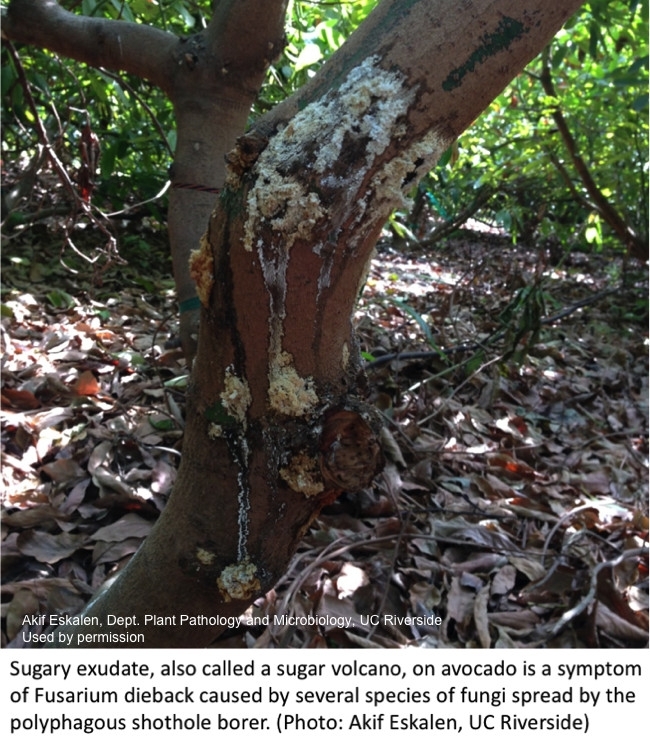 The invasive species killing trees is causing sugar volcanoes to erupt on avocado trunks and branches that might be infected with Fusarium dieback. Fusarium dieback is a invasive, beetle-vectored disease that causes damage on avocado and more than 39 other tree species. The disease has spread in urban forests and wild lands in the Los Angeles basin since early 2012, and in Orange and San Diego counties since early 2013 and Ventura County in 2015. The symptoms — staining, sugary exudate, gumming and beetle frass — are often noticed before the tiny beetles (1.5–2.5 mm) are found. Avocado is one tree host. Shothole borers successfully lay eggs and grow fungi in many tree hosts, with some of these trees susceptible to the Fusarium dieback disease. For more information about tree host species, where the shothole borer is in California, and what symptoms look like in other tree hosts, visit the UC Riverside Eskalen Lab website or the Invasive Shot Hole Borers website.